Product prices and availability are accurate as of 2019-02-18 05:50:59 EST and are subject to change. Any price and availability information displayed on http://www.amazon.com/ at the time of purchase will apply to the purchase of this product. AquaBackup BatteryOn - Providing constant aeration to your fish tank is vital for the health of your fish. For that reason we've created BatteryOn to give you peace of mind during power outages. When the BatteryOn control system senses a power failure, it switches power to a battery* which you can use to power a DC aeration device or water pump. When electricity is restored, BatteryOn automatically disables the battery and any connected devices will stop. Of course, with the regular power now back on, your normal system air and water pumps will resume running. AquaBackup with pump Perfect for use with our AquaBackup Oxygen Infuser 500 and the Oxygen Infuser 1100! BatteryOn Plus includes the BatteryOn elements PLUS a battery box sized to hold a marine "Series 24, 27, or 31" battery, PLUS an integrated battery charging system. All you have to do is install a marine, deep-cycle battery, connect any battery-driven DC device like 12V DC Pump, and plug in the main power cord. Not included: 12V DC Deep Cycle Marine Battery, Series 24, Series 27 or Series 31 12V DC Pump *Battery not included because it is very heavy to ship, and we wanted to give you the choice of which battery size and quality to purchase. Series 24, Series 27, or Series 31 all fit well in the battery box provided with BatteryOn. BatteryOn Plus gives you peace of mind during power outages. When the BatteryOn Plus control system senses a power failure, it switches power to a battery* which you can use to power a DC aeration device or water pump. This model detects when household AC power fails and instantly activates a battery. The battery can be used to power a backup aerator and/or a water pump. Just plug it into main power, connect it to an appropriately sized battery and to any battery-driven 12V DC pump. 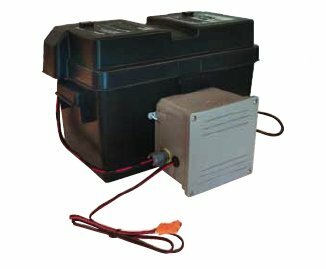 BatteryOn Plus includes the BatteryOn elements PLUS a battery box sized to hold a marine "Series 24, 27, or 31" battery, PLUS an integrated battery charging system.